Worcestershire have signed Alex Hales on a month's loan from Nottinghamshire. Hales, 25, who became the first England player to score a Twenty20 century in March, is available for the club's next three County Championship games. 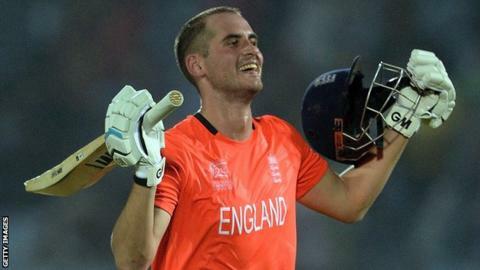 Hales became the first England player to score a century in Twenty20 cricket with a brilliant 116 off 64 balls against Sri Lanka in Chittagong in March. He played alongside Moeen Ali in all four of England's World T20 games in Bangladesh against New Zealand, Sri Lanka, South Africa and the Netherlands. He has been brought in as cover for Moeen Ali, who has been named in the England squad for next Friday's one-day international against Scotland. "Everyone at New Road is delighted at Moeen's selection," said Worcestershire director of cricket Steve Rhodes. "To lose a player of his quality is a blow to the team but to replace him with a loan player who is currently ranked as the number three Twenty20 batsman in the world is a major coup. "He is keen to show his abilities in the four-day format and impress the national selectors." Hales endured a poor season in Championship cricket in 2013 and has only played in one of Nottinghamshire's three Division One matches so far this season, making 61 and nought against Lancashire at Trent Bridge. He is likely to get more time in the middle with Division Two leaders Worcestershire and will make his debut against Glamorgan at Cardiff on Sunday as they chase a third-successive victory. England are set to play Sri Lanka in five ODIs and one Twenty20 (20 May to 3 June). The batsman will also be available for the trips to face Kent at Tunbridge Wells, starting on 25 May, and Surrey at The Oval, which begins on 1 June. Whether he can play in the home fixture with Essex, beginning on 18 May, will depend on whether he is selected for England's T20 international with Sri Lanka at The Oval two days later. Hales has played 31 Twenty20 games for the national team, scoring 956 runs at an average of 36.76, and a strike-rate of over 136 per 100 balls. He made his first-class debut in 2008 and has since scored 3,428 runs at an average of 33.94, including six centuries and 23 fifties.